Today, several local reporters and editors, including myself, sent a joint letter to the City Auditor requesting an investigation into city officials’ practices of using private email accounts and other private electronic media to conduct city business. Below is the letter we sent, along with the attachments demonstrating the extent of the issue. The City Auditor reports to the City Council, an arrangement that usually is well-suited to the Council’s oversight responsibilities over the executive branch. In this case, however, the issue implicates several (if not all) City Council members and their staff, as well as the Mayor’s office. Since there is a pending lawsuit that addresses the issue of city officials conducting business through private channels, it is unlikely that the Council or the Mayor will weigh in on the issue or request the Auditor to spend time investigating this. However, the Auditor’s Office is empowered to conduct its own self-directed investigations, so it can decide to do this on its own. I’m going to make an unusual request here: if you believe this is an important issue, please send an email to City Auditor David Jones, davidg.jones@seattle.gov, asking him to conduct an investigation. Yesterday Wells Fargo Bank sent a letter to the City of Seattle in response to the Council’s action to cut its business ties with the bank. In the letter, Wells Fargo’s Head of Government and Institutional Banking expresses its disappointment with the decision, invokes some concern trolling over the resulting “unintended consequences for taxpayers,” and defends its investment in the Dakota Access Pipeline project. The letter departs from the humble, apologetic tone of their last letter and disingenuously skips over or distorts inconvenient facts. Let’s dig in. Two months ago, a warehouse in Oakland known as the “Ghost Ship” caught fire and burned, killing 36 people. It was being used as a live-and-work facility for people in the Bay Area arts community, and there were numerous building code violations in the building, on top of illegal occupancy, that contributed to the tragedy. Could an incident like the Ghost Ship fire happen in Seattle? Easy question: it absolutely could. The hard question, however, is what the city should do about it. And that was the subject of a two-part discussion in the Council’s Civil Rights, Utilities, Economic Development and Arts Committee this morning. On Monday, Council member Sawant introduced a draft ordinance in response to recent unsavory acts by Well Fargo Bank. Let’s look at the details of that bill, as well as the recent back-and-forth communications between the city and the bank. Today Mayor Ed Murray, City Council President Bruce Harrell, and Council Budget and Finance chair Tim Burgess sent a letter to Wells Fargo backing out of a $100 million bond financing deal because of the recent allegations of illegal business practices at the bank. Earlier this week Council member Lorena Gonzalez, the chair of the Gender Equity, Safe Communities, and New Americans Committee, circulated a letter for her colleagues on the City Council to sign. The letter is addressed to the U.S. Citizenship and Immigration Services, and raises concerns about their proposal to increase fees for naturalization. The fee for Form N-400, Application for Naturalization, will increase from $595 to $640 — though they are also proposing a reduced fee of $320 for those whose household income is between 150% and 200% of the federal poverty guidelines. The application fee for form N600/600K, Application for Certificate of Citizenship, will increase from $600 to $1170 — almost doubling. As the letter points out, this certificate is often required for a naturalized citizen to work or vote. The fee for filing Form N-565, to replace a naturalization or citizenship certificate, will increase from $345 to $555. Why is USCIS doing this? Simple: the entire department — all immigration and naturalization services — are funded by these fees. That includes adjudication of refugee and asylum processing, the operation of the Office of Citizenship, and the Systematic Alien Verification for Entitlements (SAVE) program. As the Council’s letter points out, that’s fundamentally broken. Why should we care? Because as a recent study points out, naturalization of permanent residents provides significant economic benefits both to the new citizens as well as to the local, state and federal government. As of 2012, Seattle had 86,130 foreign-born residents — 18% of the population — of which 56,171 were already naturalized citizens and another 22,648 were eligible to naturalize. 49% of those eligible residents have at least 2 years of college education, and only 20% have limited English proficiency, making them highly employable in our growing local economy. The study claims that nationally naturalization causes individual earnings to increase by an average of 8.9%, the employment rate to rise 2.2 percentage points, and home ownership to increase 6.3 percentage points. 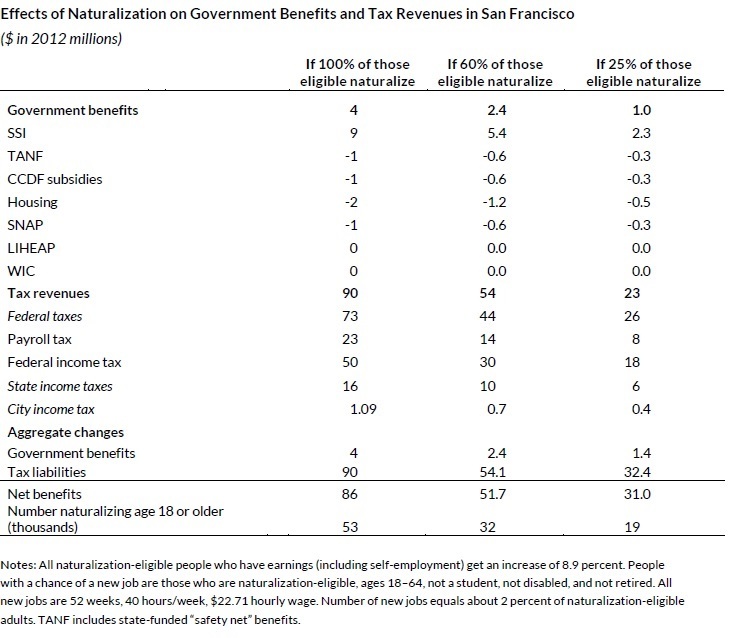 That also means there is a decrease in government benefits paid to those new citizens for many programs (with the exception of SSI — a program for extremely low income citizens), and additional tax revenues from their increased income (and personal spending). Seattle’s numbers would actually look better than San Francisco per capita, since it has a higher percentage of eligible immigrants with college educations and a lower percentage of those with income at or under 150% of the federal poverty level. USCIS is moving the only lever it has to raise revenues, but it does seem counter-productive to raise additional barriers to becoming a U.S. citizen when the benefits to naturalization are so clear.